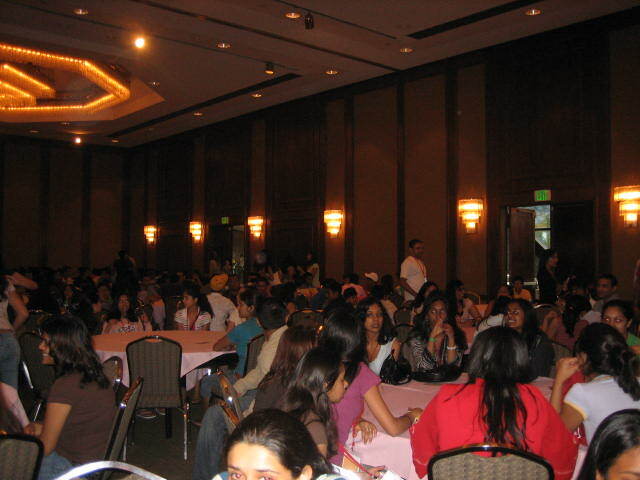 More than 600 young, enthusiastic, and curious Jains assembled in Stamford, Connecticut from July 1-4, 2006. Congregating in the Westin Hotel in the heart of Stamford, youth arrived from across the United States, in addition to Canada, Singapore, and India. This gathering was centered on one large mission: “ to be a forum for education, dialogue, and debate for the Young Jains of America. 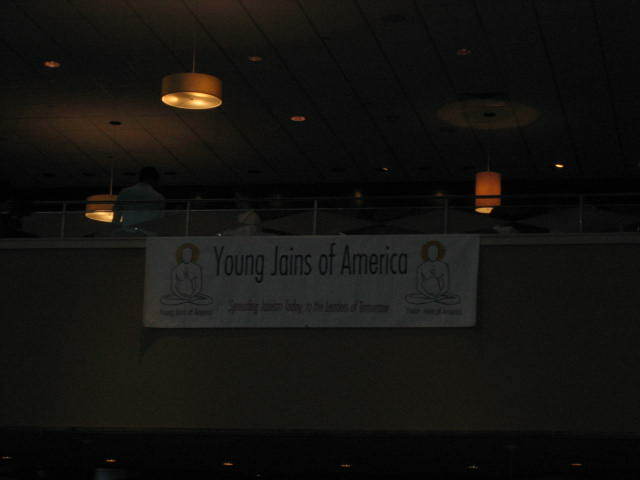 The YJA was founded in 1991 as a chapter of JAINA (Jain Associations in North America), and as a joint venture with the Jain Center of Boston’s Convention Committee. YJA proudly presented the 7th Biennial YJA convention in 2006 to over 800 attendees, organizers, speakers, and volunteers. Having hosted conventions in Chicago (1994), San Francisco (1996), Houston (1998), Los Angeles (2000), Mahwah, New Jersey (2002), and San Francisco (2004), the YJA Board and Executive Committee were veritable experts in hosting such a large group of youth, in addition to recruiting scholars, Jain monks, and inspirational speakers, all attuned to the needs of young Jains in the modern world. Parin Ccheda, a member of the YJA board, noted that it required about one year, the full cooperation of the YJA board and the Boston Convention Committee, financial resources from individual and corporate sponsors, and the assistance of the local governing bodies, to effectively plan an event such as this. Notably, the event was entirely the work of the innovation, organization, and direction of youth board members. 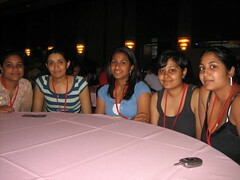 These youth organizers successfully reached out to numerous resources for support during the process of planning YJA 2006. The Souvenir Book of the convention included a welcoming letter from M. Jodi Rell, the Governor of Connecticut, and a Proclamation from Stamford Mayor Dannel P. Malloy recognizing July 1-4, 2006 to be “Young Jains of America Days.” Other letters of appreciation were sent from the leadership of Connecticut Jain Centers, Jain monks, and the President of JAINA. It was evident that great preparation had been accomplished by the YJA Convention Committee, and formality and organization pervaded the convention itself as well. Attendees wore business casual attire during the daytime sessions, and were required to follow a rigorous schedule that combined ample time for eating and socializing with 5 or 6 intense, one and a half hour speaker sessions per day. There were scarcely any moments of idle wandering on the part of the convention attendees from the hours of 7:00 AM to 10 PM, as the well-structured schedule demanded it be so. Each morning began with yoga and meditation classes, followed by lectures, keynote speakers, and evening performances. As in past conferences, participants were separated into three age categories: high school, college, and post-college. The high school and college groups participated in the same sessions, but at different times, facilitating interaction among youth of the same ages. Post-college attendees participated in a line of sessions characterized under the Jain Networking Forum (JNF) heading. JNF grew out of the Young Jain Professionals, a youth group founded in 1996 by YJA that has developed into a networking, socializing, and leadership forum for Jains in their 20’s and 30’s. TV Asia covered the entire convention, and interviewed attendees on their experiences at the convention and their involvement in the Jain community at home. This year’s convention theme was an adaptation of spiritual and social leader Mahatma Gandhi’s immortal words: Making Our Life Our Message. Gandhi famously once said, “My Life is My Message,” and thus the youth of this convention were consistently encouraged to reflect on their actions, their thoughts, their words, and their life to fulfill not only the duties of Jainism, but the duties that reflect on humankind. The convention strove to nurture the leaders of tomorrow to carry the teachings of Jainism into their future, be it religiously oriented or not. The official title of the 2006 convention was Jain Evolution. This evolution was spoken of in a number of ways: the evolution of the religion into a major force in the lives of young Americans, the evolution of the youth into the business, service, and health professionals of the future, and the evolution of the spirit of Jainism into a philosophy of truth for thousands of young Americans. In the mid to late twentieth century, Jain immigrants to the United States were set with a task. Not only did they carry the responsibility of establishing themselves professionally in North American society, but they also bore the weight of being the de facto founders of an effectively “new” religion, a Jainism for the West. Perhaps it is because first generation immigrants adapted their religious fervor to the setting of a new culturally and religiously pluralistic society, that their own children have developed youth conventions and organizations like YJA in order to discuss Jainism in their own terms. Vinita, a veteran convention attendee who has been to each YJA and JAINA since their nascence, noted that her interest in Jainism and its importance has increased over time. Each convention has been different; each brings a new issue for young Jains to the table, facilitating intelligent discussion and debate among American youth that is necessary for Jainism’s survival the West. Jain Evolution refers to our continual redefinition of what it means to be Jain. Our time-honored scriptures suggest how one lives life as a Jain, but do not provide a framework for modern day. After this Convention, we hope that you will have developed your own guide on how you can make your life your message. The significance of an ongoing Jain evolution was no more evident than in the session called Jain Vision 2020. In this session, the JAINA Long Range Planning Committee (LRPC) presented their insight and ideas regarding the development of a strategic plan to bring Jainism to a new level in North America over the next 15 years. Through collaboration with the Kellogg School of Management’s Dean Dipak Jain, an active member of the Jain community, the LRPC seeks to evolve Jain practices, grow in numbers, expand awareness of the religion and culture, and strengthen the JAINA organization. Among the tools for achieving these goals involves bringing young leadership to the forefront and working together to take the religion and manage it as though a business. Indeed, the so-called branding of Jainism seemed to be a primary target for scaling up the opportunities for the community in the professional and spiritual arenas. Because Jainism does not have one easily accessible scripture or collection of texts on Jain wisdom, a major setback to the community has been the lack of textual guidance for Western youth. An innovative idea for how to preserve and disseminate the Jain message has been to create a book on Jainism for non-Jain spouses and for the world at large, and its draft was presented in part at the convention by the President of JAINA. Bhajan Nation Remix: The speaker will present his own contemporary beat productions of Jain bhajans (devotional songs). The attendee will be astonished at the impact bhajans can have when they are tuned to a more popular tempo. Jainism. What It Means to You: This session discusses the practical side of Jainism and how to practice Jainism in and around different faiths and stereotype atmospheres. Contemporary Issues: What is Jainism’s take on the contemporary issues of today. In a world full of conflict, we hope to find shelter under the Jain dharma but what types of answeres does it provide for us? In this session, issues such as religious discrimination, interracial and gay marriage, and capital punishment, among others are discussed. One stand-out session was guided by YJA participants themselves. Two medical students presented a discussion linking Jain values to science aptly titled “Linking Karma, Genes, and My Actions.” In this session, the speakers noted that advances in science can coexist and potentially reinforce religious ideas. They suggested that karma linked through an individual’s genetics contributes to the interaction between the metaphysical notion of karma and the changes that occur to people in the physical world. In this way, one of the core principles of Jain thought, karma, was brought to the forefront and discussed with regards to the roles biology and fate can play in the life of a young Jain. As many speakers were young adults and participants in the convention themselves, a noteworthy characteristic of the sessions was that youth were being taught by youth. Debates were facilitated and moderated by peers, and the overall experience of the youth in the convention was being buttressed by their shared understandings with other youth. Other speakers at the convention ranged from Jain scholars including Chitrabhanuji and Presidents of regional Jain centers to young and adult professionals who have taken up the cause of teaching Jainism to their colleagues and younger Americans. Non-Jain speakers like Nimesh Patel, a South Asian hip hop singer and vice-president of an independent South Asian record label spoke to youth on the importance of passion and purpose and how to do what one loves. This diversity of leadership at the convention contributed greatly to an atmosphere of high scholarship and intelligence in addition to subject matter for discussion suitable to youth of all ages and interests. Each evening of the convention culminated with a social event which all participants were encouraged to attend. The first evening featured the traditional Gujarati dances, Gaarba & Raas, at which all attendees donned Indian attire, and danced in concentric circles to a live performing band invited specially from India. 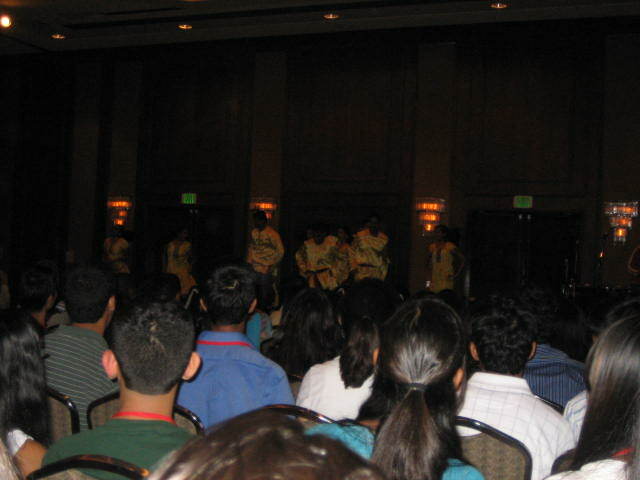 A Dance Competition followed the next night, in which participants performed both group and solo acts before the convention attendees. The stand out performance of the evening was by Karmacy, a South Asian hip hop group featuring two Jain members whose bilingual songs seek to represent the everyday realities and philosophies of cross-cultured individuals. The final evening of the convention featured a series of social events, catering to both the teenage and JNF attendees. A speed dating game attracted almost 80 JNF participants, the semi-formal Bollywood Ball was a vibrant event with the assistance of a renowned New York South Asian DJ, and the after-hours lounge in the hotel lobby was packed with JNF youth exchanging last minute contact information and networking with each other. Intermixed with these formal events were a small number of recreational hours when youth could play outside, spend time in informal discussion with friends, or browse through the Convention Exposition. The Cruelty-Free Expo provided the national visibility of companies whose ideals and principles are in line with those of Jainism. Included in the Expo were representatives for the South Asian clothing line BadKarma, a Jain vegetarian cookbook vendor, and a bone marrow drive representative. The well-planned Expo served as a great source of information to the attendees that reached far beyond debate and discussion on the ideals of Jainism. Indeed, it provided a number of venues through which they could practice and live out their evolving cultural and religious practices in the modern world. For the first time at a national convention, the Jain Networking Forum played a major role in the events and sessions of young adults ages 21-29. In addition to the regular sessions attended throughout the weekend, JNF participants had the opportunity to meet each other and network in novel ways through teambuilding exercises, career forums, and leadership seminars. Networking and leadership building within the young professional community was a primary goal this convention sought to nurture. The first session every JNF participant attended was Networking Basics. This session was guided by Sarano Kelly, a successful entrepreneur turned inspirational leader who carries a message of directed attention and the power of presence to his leadership seminars. This forum set the stage for other JNF teambuilding and networking exercises that encouraged the development of social networking skills while consistently maintaining the values and upstanding character that Jainism demands. Later in the weekend, a series of career panels were held for individuals, at any stage in their careers, to explore and find guidance from experienced Jain professionals. Panels were designated as Entrepreneurship, Moving up the Corporate Ladder, Law and Politics, Medicine: Choosing Your Speciality, and Non-Profit/Miscellaneous Careers. Some interesting questions included how to face racial and cultural discrimination in the workplace, and how to balance Jain values and professionalism with the aggressive demeanor required in a cut-throat business atmosphere. According to the YJA Executive Board, these Q&A sessions were opportunities for the young professionals to take advice from experienced elder Jains, and also to connect with their peers in a comfortable, non-competitive environment. A secondary aspect important to the mission of JNF is the issue of marriage. Many Jains in this age group attend YJA and JAINA conventions seeking out partners with shared customs, habits, and family values. This year’s convention provided a different resource, by planning sessions centered on the pressures of marriage and relationships. One seminar entitled “Career Couples” featured four couples, including an interracial couple, a couple who has had to balance their careers with children at a young age, and a couple who met online through a Jain dating service. These couples facilitated discussion on how to carry on relationships amidst careers and other complications of life, and provided an excellent preview to the challenges of adulthood for a group of youth looking tentatively toward the future. The Pressures of Marriage in the Jain Community session was also formulated into a panel discussion. This panel consisted of couples in varying levels of relationships: dating, newly married, and parents. Each brought to the table a novel viewpoint on what it is like to think about marriage in the modern world, how to deal with the common expectations of generations past, and how to balance pressures with one’s own personal needs. Jains make up a small, tight-knit community of less than 1% of India’s population and the push to marry within the community is quite strong. Therefore with marriage comes a number of important considerations: religion, vegetarianism, family background, and profession. Seminars such as this proved comforting to the many youth who are trying to manage often-conflicting family expectations. The theme of this year’s convention, Jain Evolution: Making Our Life Our Message, was no more alive than in the experiences and voices of high school and college youth. The expansion of Jain Centers to every major city in the country and the growth of Pathshala, or Jain religious schools, have contributed strongly to the growing community leadership among Jain youth. One high school junior explained that he has started a National Vegetarian Club in his high school, while another young college student is following in the footsteps of Columbia University to create the second National Jain Club at Rutgers University. If these youth were one thing, it was indeed motivated. Never before has the convention hosted so many high school students, and it was evident that instead of simply attending the convention to learn the basics of Jainism, youth were contributing to the development of a nation-wide leadership plan to keep Jainism alive and strong in the hearts of youth. By living the life, they truly were carrying the message of what it means to be Jain. Chintan Shah, the co-chair of YJA 2006 noted that the hardest part of planning this convention was in deciding what the focus should be. In choosing “Making Our Life Our Message”, he hoped the convention would foster an active, spirited, and resource-seeking atmosphere in which youth could return home rejuvenated and inspired to have their message, whatever it may be, come alive. He stated, “If we can encourage people to advance their knowledge and understanding and to increase the resources of their young community, we can one day successfully be that diaspora that leads the country.” Indeed, this convention made clear that Jainism is not limited to prayers and worship, but it can be lived, thought, and breathed. From sessions on Karma Theory, Jain Devotional Songs, and Forgiveness to Shopping Jain, Driving Social Change, and Leadership in the Community, YJA 2006 effectively brought the most interesting, difficult, and debated issues of religion, culture, practice, and young life to the table for youth to grapple with. There is no doubt that each participant left Stamford on the Fourth of July with a renewed sense of religion and sense of self. In educating on the tradition while encouraging critical analysis of its future, the Young Jains of America have found an effective method to support and lead the Jain evolution forward.